Having the best yard on the block is an accomplishment that most homeowners strive for. Unfortunately, it is a lot easier said than done. For most, growing your lawn the perfect shade of green and the ideal length can seem almost impossible. Yet there are still those homeowners who are actually able to achieve these desirable lawn qualities, but how? The contributing factors to a great lawn mainly have to do with the type of grass seed chosen and the maintenance of the lawn. Choosing the right grass seed is a process that requires some prior knowledge. Not all grass strains will grow the same especially in different geographical locations. Some possess the ability to grow in very hot conditions while other require cooler climates to thrive. In the New England area there are typically three popular varieties of grass chosen. They include: Kentucky Bluegrass, Fescue, and Ryegrass. Kentucky Bluegrass: Thick with a very vibrant color, Kentucky Bluegrass is a common choice for most. It is a cool season grass, which means that it will not grow very much during the summer months. Instead, the grass tends to grow its roots during cooler months. Fescue: Another common choice due to its ability to adapt to both warm and cool climates. Ideally this grass prefers cooler temperatures despite being able to tolerate and still grow in those warmer conditions. This grass is also shade tolerant meaning it can still survive without constant sunlight, however too much shade can stunt its growth. Rye Grass: Fast-growing and tough, this grass comes in both annual and perennial blends. The annual blend will grow very quickly but will not survive the winter, while a perennial blend that can survive will cost more and also grow at a fast rate. Maintenance requires proper watering and grooming. As discussed earlier, certain types of grass grow better with different conditions, and some require more watering than others. When it comes to cutting, always make sure that your lawn mower blades are sharp. If the blades are not sharp they will rip the grass rather than cut it, which could lead to dead or brown spots in a lawn. If faced with brown or dead spots, do not panic! There are always ways to remedy the problem. Most commonly these spots are caused from either animals or a mixture of grass being used. When animals urinate on grass, a dead spot can appear. They may snack on your grass, which can leave uneven spots with plenty of bite marks to see. The easiest way to stop this from happening is to fence in the lawn to keep unwanted animals out. 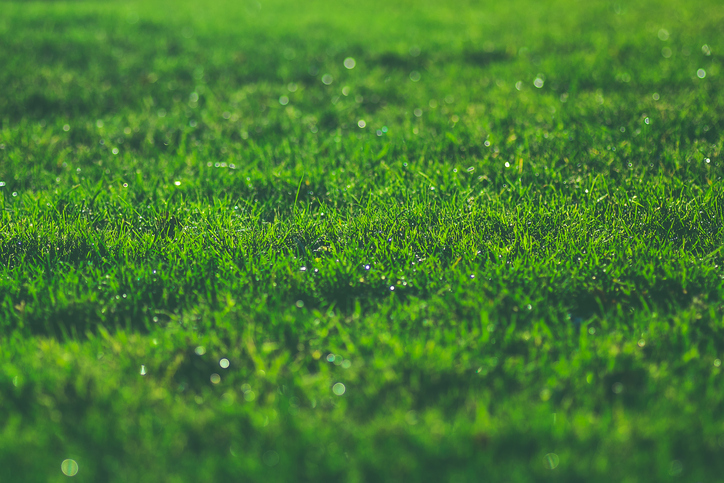 If you’re noticing large sections of grass discoloration, it may be due to a mixture of grass strains in your grass seed. The different strains could have separate dormancy periods, meaning one could be completely green and flourishing while the other begins to change. Another problem could be that the growing conditions are better for one strain of grass compared to the other. The easiest way to remedy this issue is to make sure your whole lawn is planted with the same strain of seed. As professional landscapers, Greener Horizon recognizes the importance of high quality materials in all landscaping projects, both large and small. That is why we are committed to providing our community with a variety of top-notch materials, available to contractors and homeowners alike. If you are considering cleaning up your lawn click for a free consultation with one of our professionals! We can also help with delivery and installation.